The recently-created NYU Stern School of Business Tech MBA is a one year program that requires 51 credits to complete. The first summer of the Tech MBA program consists of the entirety of business core courses, some tech core courses, and the Stern Solutions NYC Immersion. The following fall, winter, and subsequent summer semesters featured the remainder of the tech core courses, Stern Solutions Project courses, and electives. The NYU Stern Tech MBA is built around project-based learning, dubbed Stern Solutions, allowing students a unique opportunity to earn more hands-on experience than traditional MBA programs. Courses begin with direct industry preparation and immersion with New York City companies, of which include live cases with professional partners and company visits. Students will then complete real-world company projects, spend a two-week immersion in Silicon Valley in January, and present a business incubation plan at the end of the program. The NYU Stern Tech MBA Class of 2019 features 33 students that are, on average, 28-years old. Among the class, 42 percent are female, 42 percent hold international citizenship, and 18 percent are underrepresented U.S. minorities. These students joined the program with an average GPA of 3.49, a 689 GMAT score, and 5.8 years of previous professional work experience. Stern’s Office of Career Development launches an “Ignite” career development program as soon as classes begin in September, hosting panels each Friday throughout the year that feature industry presentations, resume reviews, networking workshops and mock interviews. Second-year students have access to career coaches, who offer personalized advice on resumes and job search strategies and conduct mock interviews. The total estimated cost of tuition and registration fees for NYU Stern Tech MBA students is currently $95,100. This accounts for room and board, books, supplies, local travel, extra costs, and loan fees over the course of one year. Tech MBA students are offered opportunities for financial aid, scholarships, and graduate fellowships, most of which are awarded at the time of admission. U.S. citizens and permanent residents applying to Stern’s Tech MBA program are eligible for federal Stafford and Graduate PLUS loans, as well as private loans. International students are eligible for private loans, offered with and without a U.S. co-signer. Loans not requiring a co-signer include the UFSB Stern International Loan, offered through the First Marblehead Corporation and Union Federal Savings Bank; the Global Students Loan, offered through the Global Student Loan Corporation to students from India; and the BAEF MBA Fellowship, offered through the Belgian American Educational Foundation Inc. to Belgian citizens. International students with a U.S. co-signer are available for numerous private loans up to the full cost of attendance, and are provided with a list of these options upon receiving offers of admission. 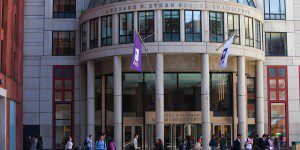 Applicants to the NYU Stern Tech MBA program are required to hold an undergraduate degree. However, there are no minimum GPA or standardized test score requirements for admission. Applicants to the full-time MBA program must submit the online application, test scores from either the GMAT or GRE exams, a professional resume and a separate Work History Form provided by Stern on its application website. Stern also requires applicants to submit two essays, two professional recommendations, undergraduate transcripts and proof of degree conferrals and an application fee of $250. All applicants whose native language is not English and who have not completed academic studies in an English-speaking country, or a country where English is the primary language used in education, must take the TOEFL exam and submit their scores with their applications.